This kitschy monument has been promoting Georgia’s largest cash crop to passersby on I-75 for nearly forty years. Designed by A. R. Smith, Jr., it was sponsored by the Georgia Peanut Commission as a tribute to the peanut industry and as a memorial to Nora Lawrence Smith, longtime editor and publisher of The Wiregrass Farmer. And while there are other monuments to America’s favorite legume scattered around the country, this one is the largest. The peanut was toppled during Hurricane Michael on 10 October 2018. 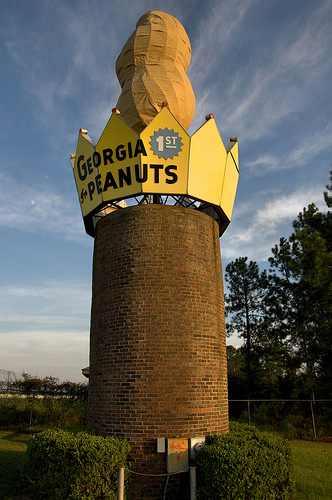 I lived in Valdosta, Ga in 1975 and close friend of Franklin Creasy the person that constructed the giant peanut. I had small part as helper with my friend. Frank was a beautiful talented person (now deceased) having a masters degree teaching school, excellent professional photographer, well driller, boat builder, peanut builder (1), blue berry farmer and craftsman of many accomplishments. Brilliant man, liked by all he met. I have made several photographs of this on my way to Valdosta. I am always amazed at the people who stare as I park my car and get out to get another photograph to add to my already dozens..
I’ve gone through Ashburn more times than I can remember on I-75 from Florida and cannot believe I’ve never seen this peanut. Maybe I keep my eyes on the road to much. Accidents happen so fast I’m afraid to view the scenery traveling down I-75.